The power mode must be in ON to use the heated steering wheel. Press the button on the left side of the steering wheel. When a comfortable temperature is reached, press the button again to turn it off. The heated steering wheel is turned off every time you start the engine, even if you turned it on the last time you drove the vehicle. 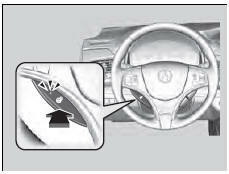 Do not use the heated steering wheel continuously when the engine is off. Under such conditions, the battery may be weakened, making the engine difficult to start.